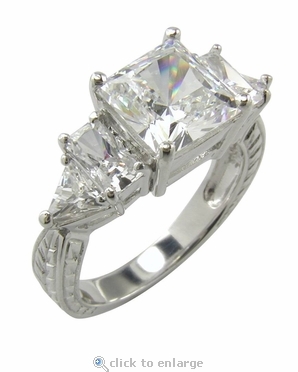 Our Princess Cut Cubic Zirconia Baguette and Trillion Estate Style Engraved Engagement Ring features a 1.5 carat 7x7mm radiant princess cut stone that is set in a beautifully engraved estate style ring. This engagement ring features a single baguette followed by a trillion flanked on each side of the center stone. Engraved detailing down both sides of the shank add to the estate style look with a custom feel. The princess cut, baguettes and trillions have a total carat weight of 3 carats. 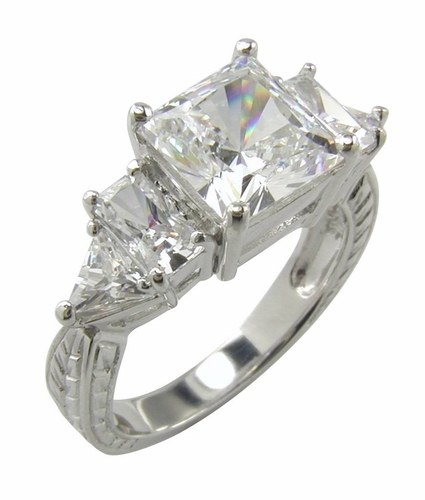 All of our rings include the highest quality of Russian formula cubic zirconia set in a solid diamond quality mounting. Get in on this fantastic price. Due to extremely low pricing, all clearance sales are final. Clearance items may be sized for an additional fee of $35. Sizing below a 5 or above an 8 is subject to additional fees. Please call for a quote.